Is Consumption the Point of Economic Activity? consumption is the point of economic activity; why work except to obtain things? I have heard this line before. To me, it sums up the essence of the consumption economy: The only purpose of work is to consume. I would like to raise two objections to this statement–one technical, one philosophical. First, even if you believe that consumption is the only point of economic activity, presumably we care about the consumption levels enjoyed by our children, and our children’s children’s. So if you care enough about future generations, you personally will choose to consume less and invest more today. Given that we as a society are running up big debts, it is highly likely that our children will be better off if we choose to invest more today and consume fewer goods and services, whether they are imported or domestic. Under current circumstances, there is no moral imperative to consume. Second, I’m going to wax a little philosophical here. Mr. Avent writes that “the only purpose of work is to consume.” That’s a little bit like the people who say that the main goal of life is to be happy. I would disagree with both statements. I would say that once we are above some level of income, the main goal of work (and life) is to contribute to society in the best way we can. Happiness (and consumption) flows out of that contribution. P.S. I wouldn’t have any trouble at all with a trade deficit if we had a high rate of investment. But our current level of net investment, in nominal dollars, is less than half of what was before the recession. We’re borrowing from the rest of the world to fund our consumption today, not our investment and productivity gains. Let me explain: I believe that the U.S. has come to a fork in the road. The direction we’ve been going leads to the the consumption economy, putting more resources into consumption and distribution rather than production. It hasn’t been working for us. The U.S. needs to change course to a production economy: put more emphasis on investment in physical, human, and knowledge capital, and less on consumption as the yardstick of success. We need to take up our fair share of the global productive burden. To see one indicator of the consumption economy take a look at this chart. It tracks the buildings used for manufacturing (production) versus buildings used for retail, wholesale, and warehouses (distribution). 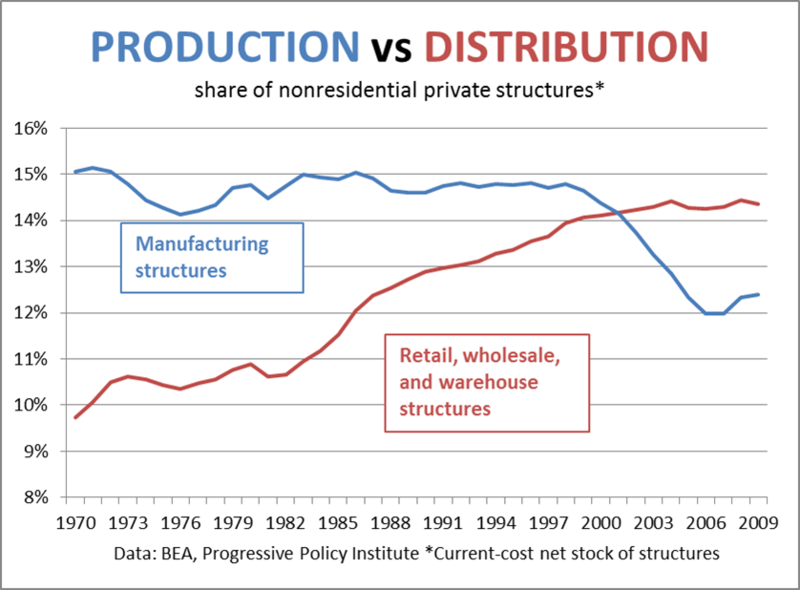 Around 2001 the lines crossed, a sign that distribution was becoming more important than production in the U.S. economy. The goal of a consumption economy is to provide consumers with low prices and wide variety, with less concern about jobs and wages. In a consumption economy, successful corporations are the ones who can best manage their global networks of suppliers to obtain the lowest costs. Offshoring is a mark of pride, showing that companies can meet the desire of their customers for lower prices. In theory, a consumption economy can be a great thing. Low prices can presumably bring higher living standards for households, as real wages rise. In theory, production is not an essential component for economic prosperity if you can create the product and organize the production and distribution process. However, Apple is Apple. For the rest of us, the consumption economy isn’t working so well. I promised myself I would stop writing excessively long posts, so I’m going to stop here for now. Obviously this does not include software.